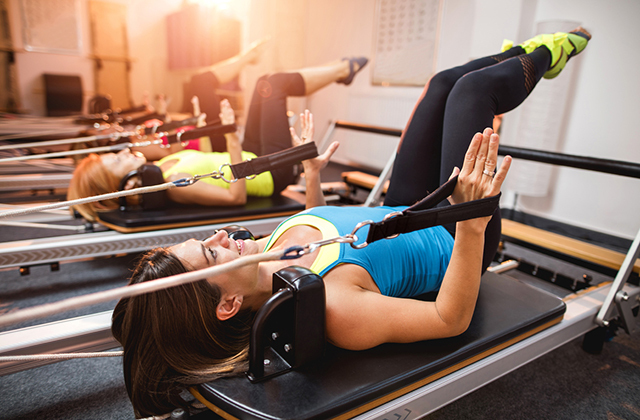 People ask me when they sign up for their first Pilates lesson “How often should I do Pilates?” My response is usually, “That depends on what kind of results you want.” You can reduce back pain with one session. You can relieve stress at the end of a long week with one session. But if you want to get a six pack, run a marathon without injury, get back into pre-baby shape, or simply tone up some flab… make the commitment to Pilates 2-3 times a week. I’ve been actively interested in health and fitness for the past 20 yrs., I’ve learned from an Pilates instructor course about the useful forms of exercises. Ideal body… mental vigor …. spiritual enhancement! Who wouldn’t want all that with just 4x a week?! Sarah has a busy life – corporate job, late nights, long commute to and from work. She signs up for a 10 class package and comes regularly 3x week. When she can’t make her regularly scheduled session, she signs up for another day that week. She supplements her Pilates with TRX classes plus cardio at the gym. After a month, people start asking her what she’s doing. She notices she’s sitting taller, walking taller, and thinking about Pilates in her everyday life. The nagging pain in her shoulder and neck has disappeared. She begins to see muscle definition. She tries a move in class that she didn’t think she could do and nails it. She has already moved on to more advanced work and has passed the beginners who started the same time as her. Martha, who also has a busy life (because who doesn’t?) starts with 2 sessions that take her 3 weeks to complete. She decides to commit and also buys a 10 pack which she plans to supplement with Yoga classes. She starts out with great intentions at 2 times a week and very quickly feels her abs firming up. Then she gets busier, works late, chooses to go out to dinner with friends instead of attending class. She ends up taking only one session every two weeks. Each time she exercises she forgets what she learned in previous classes and feels like she’s slowing the class down. She notices that Sarah, who started the same time as she did, is getting more of the exercises and seems to have advanced quickly. Her back hurts while gardening. She starts to wonder if the 10 pack was worth it …. 1.Pilates has a steep learning curve! It requires regular practice and lots of concentration. There are over 500 exercises to learn. Each exercise has a name and a purpose (often several). Each one has a breathing pattern. There is a general sequence, and transitions from one exercise to the next. The equipment setup is important for safety and must be learned. 3.Pilates exercises have a distinct progression from beginner to advanced. The same exercise can be made more difficult by performing on one leg, adding/subtracting a spring, changing your position. You may find yourself in a class with mixed levels. How will you know how to make the exercise safe and appropriate for your level? Yes, Pilates can be expensive. Private sessions can run anywhere from $40 to $100 a hour. But studios drop their prices the more people you add. There are lots of options for fitting Pilates into your life 2-3x a week. You can do matwork anywhere… your living room, the beach, even in bed! There are now thousands of videos available online. For $20 a month you can join Pilates Anytime, an online video website where you’ll find hundreds of hours of instruction from some of the best teachers in the business. To really see results, find a great studio and take an equipment session 2-3x a week with a certified trainer. If you can afford private sessions, it will optimize your results. While privates can be cost prohibitive, you can still get results from duets, trios, and quartets. Even once a week equipment sessions can still be effective. I often recommend supplementing 1 or 2 classes a week with one private session. You can learn new exercises, fine-tune your practice for your specific body issues, and then apply and practice what you’ve learned in mat or group equipment class. Be wary, however, of claims that Pilates is great for burning fat. If you expect a 1x week Pilates session to get you thin… you may be disappointed. But adding Pilates to a fat-burning regimen of cardio and healthy eating can keep you injury free while helping to sculpt and tone. Or, look for a Pilates fusion class that combines Pilates-based moves with fat-burning cardio. Ideally, Pilates is something you do 24/7. Joseph Pilates was all about the mind body connection. Ask google how long it takes to create a habit and you will get an answer around 21-28 days. (Though there seems to be little scientific proof!) Focusing on Pilates concepts everyday can help change old postural habits (e.g., slumping in our seats, rolling our shoulders forward, standing in one hip) The more you do it… the more natural positive postural habits become. Once a week is great … 2 times a week is better … and 3 times a week is amazing! And remember, Pilates doesn’t have to be your only exercise. Commit to movement everyday! Pilates just happens to be a very fun and effective way to do it! To help you, The Mind 2 Body Fit Studio has a variety of private, small group, and classes to make Pilates part of your life everyday! Check out our schedule for a a class that fits your lifestyle!